« Happy Birthday, Derangement and Description! This entry was posted on November 13, 2009 at 9:30 am and is filed under photocomics, text. You can follow any responses to this entry through the RSS 2.0 feed. You can leave a response, or trackback from your own site. 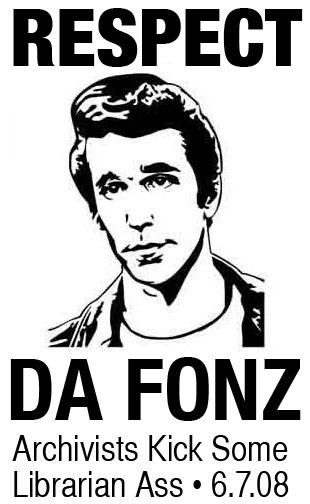 I have always been partial to http://patriarchive.files.wordpress.com/2008/06/fonzie.jpg, myself. Also, as I tweeted earlier this morning, being in a position where the Records Management list has more of a sense of humor about something than you do is a bad place to be. Hee! That was my Halloween costume last year. Brilliant. Simply brilliant. Could you also do a webcomic about that very not funny and kind of sexist “Friday Funny” that went out today and makes me think that the writers of Everybody Loves Raymond called ten years ago and want their B material back? Yuck! Absolutely. Look for a photocomic early next week. Could you do one on all the people who say their kid never writes about their archivist parent for “What my parents do” school projects? Whenever this comes up, all I can think is that their elevator speech must be either a) non-existent or b) full of archivist jargon. Ooh, I like it! Might take me a few days to come up with a good script, so if you have ideas, let me know!